Since 2001, food at the American Academy has taken centre stage, since Alice Waters (of Chez Panisse fame) came to Rome to revitalise the kitchens there. 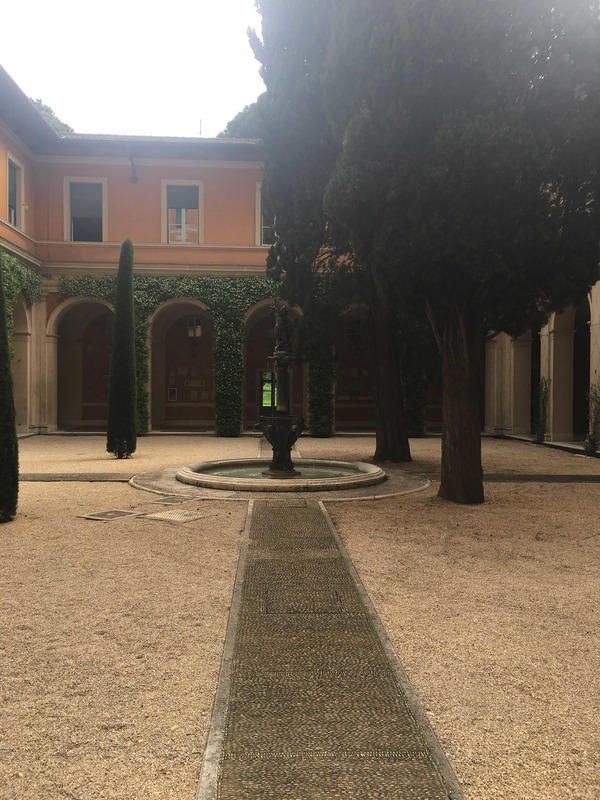 This is a really special place in the heart of Rome that functions like a modern day Renaissance Grand Patron, supporting painters, poets, photographers etc to pursue their art, putting them up and feeding them in splendour. 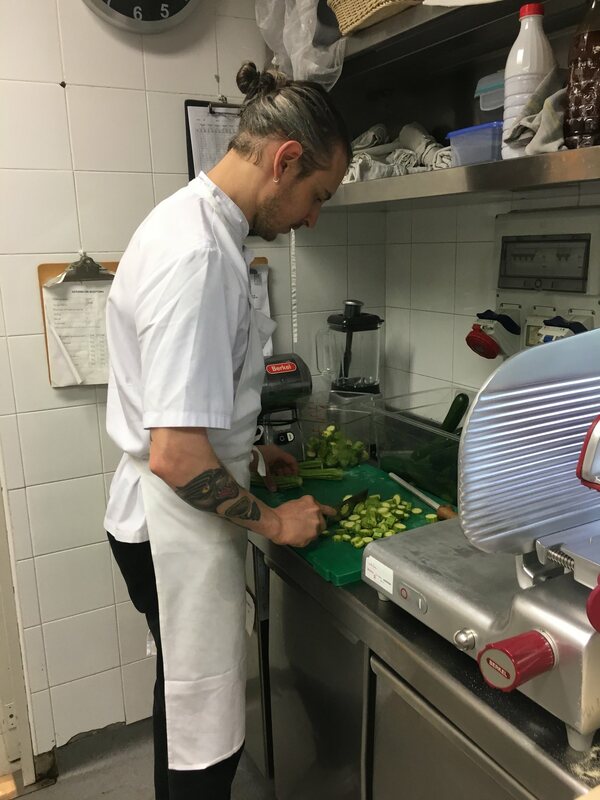 Residents here are treated to seasonal, regional food, part of which has been grown in their very own kitchen gardens. This is central to the world famous Chez Panisse ethos and Alice brought it to the Academy. 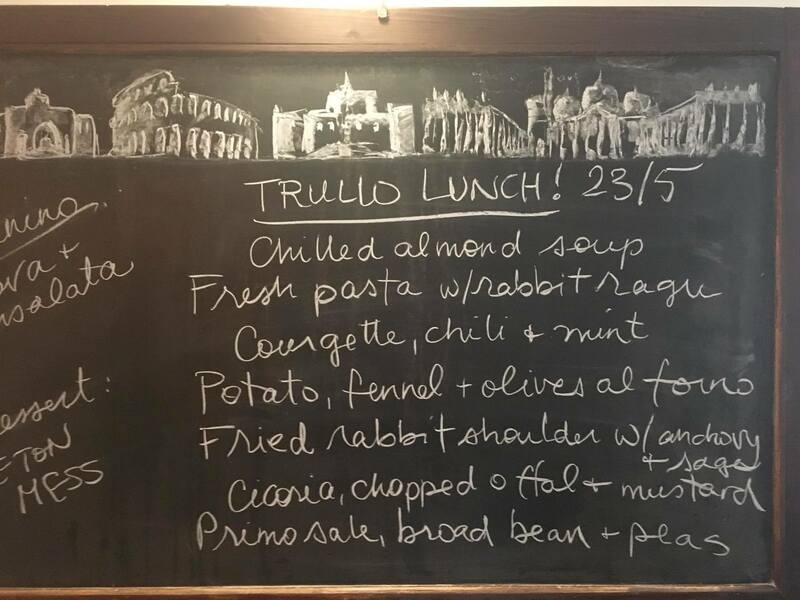 Trullo’s friend Sarah Levi, who is a brilliant chef working at the Academy, and grew up in Rome, happily invited us to “collaborate” on a lunch service with her. 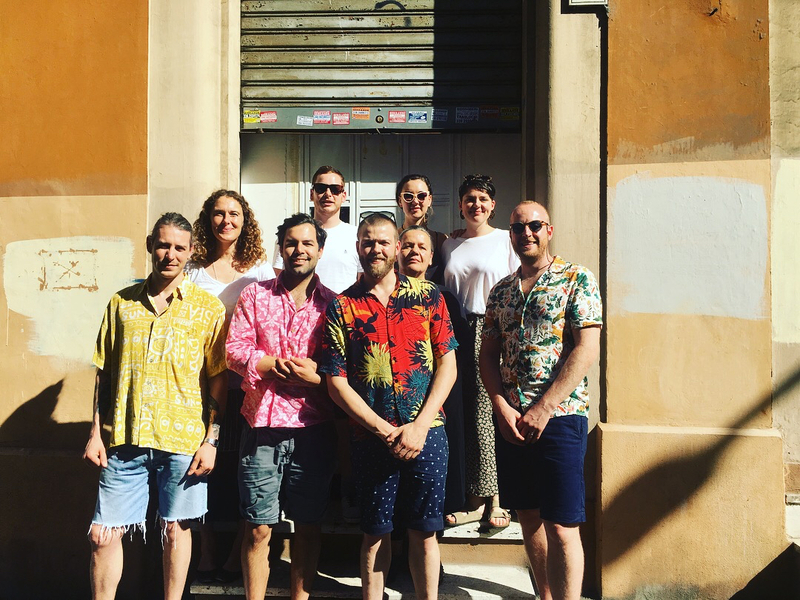 Seven of us, chefs, bakers, and front of house, arrived at 7am on our first day in Rome to discover that in fact the pressure was on. Word had spread that a bunch from a London restaurant were in town to cook for them and 15 covers quickly grew to 55. It’s a good thing some of Sarah’s student chefs were there to help out. Imagine a sort of Roman Ready Steady Cook but without Ainsley and with better produce. In came boxes of wild ciccoria, artichokes, peas, rabbits and nespole. And we were given free rein to take what we could find that looked good in the chef’s garden. Happy days. Once we had everything together we shaped our menu: chilled almond soup, pappardelle with rabbit ragu, courgette trifolate, potato fennel and olive al forno, rabbit fritti with anchovy and sage, ciccoria with chopped rabbit offal, primasale with broad beans, peas and basil and a nespole Eton mess. We were busy. Sarah had warned us that our harshest critics were going to be the twelve local Roman janitors. Those who’ve been to Trullo will recognise some familiar favourites. Sarah had warned us that our harshest critics were going to be the twelve local Roman janitors,. True to form they passed on just about everything and wanted plain pasta with pecorino instead! Thankfully the rest of the artists who sat down to eat the Trullo lunch in their beautiful high-ceilinged dining room stood to give us a round of applause as they finished. Suprise man of the match, Ivan Franco (from the floor) for his meticulous slicing of courgette trifolate. Day two and more awesome Roman women: Rachel Roddy and Carla Tomasi. Trullo owes a great debt of gratitude to Rachel who has really opened doors in Rome for us. Not least with Carla Tomasi, a big deal in Roman cooking (and in the 80’s owner of one of the first great Italian restaurants Frith’s in Soho). First up Rachel took us around the Testaccio food market to buy produce for our masterclass with Carla. Testaccio market used to be a meat market (think Smithfields, but without the architecture). It’s a little bit hidden and not on the tourist trail but it’s worth a visit. We had a pitstop for tasty salt brisket and tongue sandwiches with salsa verde at Sergio’s before arriving at Latteria Studio for our masterclass, laden with our produce. On arrival Carla plied us with focaccia she had just baked that morning, one with roasted red peppers and tomato, the other with roast onions and anchovy. What a woman. We were actually a bit nervous as we weren’t entirely sure what we were getting into. Immediately we realised Carla wanted us to get our hands dirty, so she handed out aprons and we got straight to work. Tim and Conor, between them chefs for 30 years, learnt more in these 3 hours than they had done in a long time. In fact the whole team has come back from Rome feeling creatively rejuvenated. Carla is a wealth of knowledge when it comes to anything food, a real oracle – we fired a lot of questions at her. 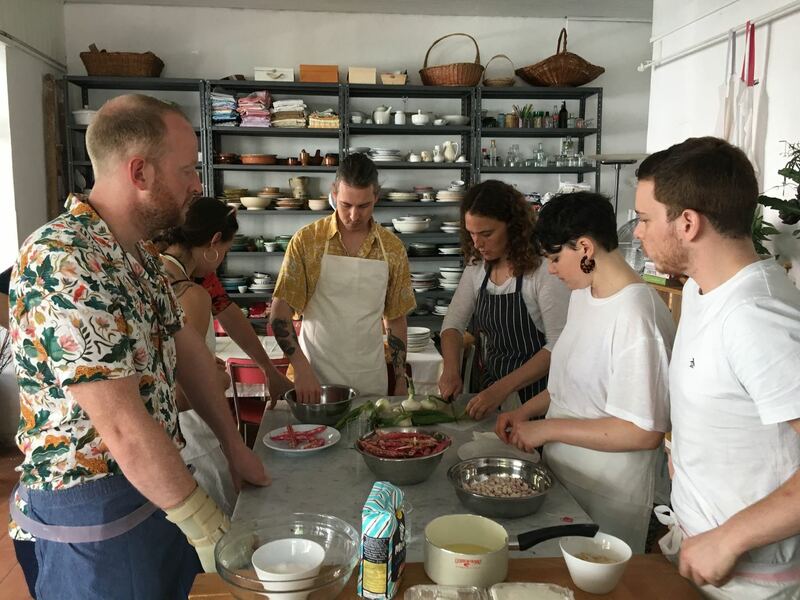 A standout dish that we have already put on the Trullo menu since returning (and is going down a storm) was metalacci with guancale she had cured herself, the sweetest of peas from Testaccio, and mint and grelots from her garden. 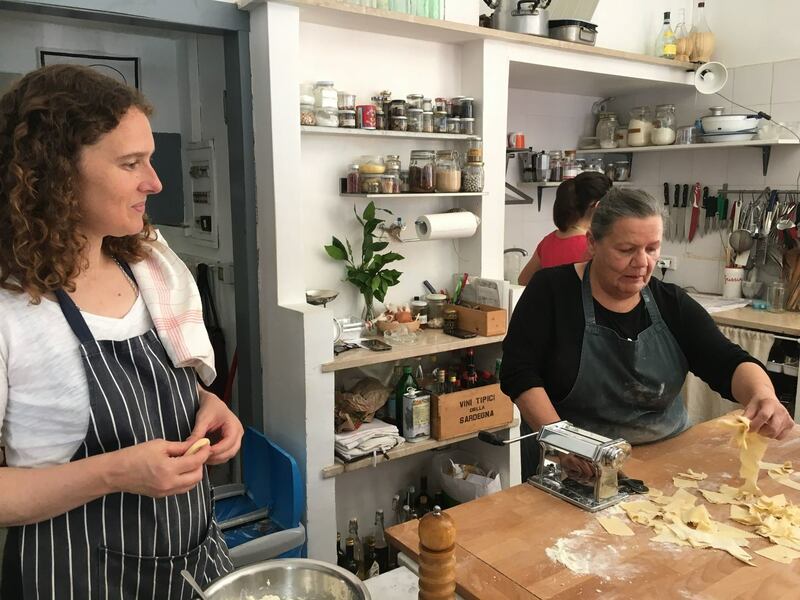 Carla also taught us how to make cavalacci, bread-pasta and some wonderful sauces including borlotti bean sauce, salt cod pine nut and raisin sauce. Once it was all done we laid the table, opened a bottle of wine and, served by Rachel and Carla, tucked in to the standout meal of the trip.